Rob Ozoonian and fellow chef Debra Stewart (far left) share pasta-making tips with (from right) Debbie Lucci, Jeff Quaglietta, and Ellen Prokop and her son, Matthew. 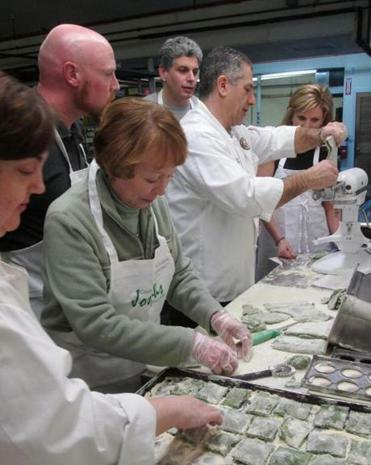 Three years ago, Rob ­Ozoonian began leading a four-hour, soup-to-nuts cooking class one Sunday every month. “Cooking with the Chefs” convenes in the spacious prep kitchen of the restaurant where he’s executive chef, Joseph’s Trattoria, Bakery & Cafe, in the Ward Hill section of Haverhill. As many as 20 people pay $105 apiece to chop garlic, saute shrimp, make pasta, and then sit down to enjoy it all with wine and conversation. Participants run the gamut from novice cooks to experienced home butchers, said Ozoonian. He also holds classes for private parties and corporate team-building events. The class we attended was unusually small, just 11 men and women, with ages ranging from 15 to 65. Ozoonian and a second chef, Rob Dellova, and dessert chef Debra Stewart put us to work immediately. Lesson No. 1: In a restaurant, you work with bigger piles of ingredients than at home. To mix a huge goopy bowlful of crabmeat, lemon juice, egg whites, and mustard, for example, you bury your gloved hands up to the wrists and knead the whole mess with your fingers. It’s fun, actually. An especially time-consuming job was making spinach ravioli from scratch. (Some of the prep work — the measuring of ingredients, in particular — was done in advance by the staff.) Three of us took turns feeding the pasta dough through a powered wringer, over and over, struggling to keep the dough from falling apart as it was rolled into thin sheets. Then we spooned dollops of a three-cheese mixture onto each green square. Later, in the restaurant, the servings of four squares each were gobbled up in seconds. Our trio of pasta-workers agreed: The ravioli were delicious, but we’re not sure it was worth all that effort. The entree was Chianti-braised boneless short ribs, served with sauteed vegetables and peaches. For this, Ozoonian relied on an old Julia Child trick: getting one batch into the oven in advance so we won’t have to wait three hours for our own batch to be done. At various work stations, students also labored over our three hors d’oeuvres: mini crabcakes with lemon aioli, polenta bites with a crimini mushroom ragu, and shrimp and avocado salad in crispy parmesan cups. We reconvened in the dining room for the leisurely five-course meal, which Ozoonian called “the party.” With a small battalion of servers, we were all served virtually at once. We sipped a selection of three wines, paired with the courses: a fruity falanghina from Campania, a fumé blanc from California, and a rich Tuscan Chianti. For dessert — bread pudding made by soaking cubes of Irish soda bread in a mixture of whiskey, eggs, cream, and sugar — the chefs joined us at the table for some animated conversation, mostly about food. As a party favor, we each were given an apron and a packet of recipes from our feast. “People always ask me, ‘Why do you give away your recipes?’ ” Ozoonian said. “I tell them, ‘Look, one of two things is going to happen. Either you’ll go home and prepare this fabulous dish, and it’ll be a big hit, but you’ll say, ‘That was so hard, I’ll never do it again.’ Or you’re going to screw it up so badly, your husband or wife is going to say, ‘Please, don’t ever do that again. Let’s go to Joseph’s next time,’ ’’ he said. Coco McCabe and Doug Stewart can be reached at newmarch@ verizon.net.